According to the National Academies of Sciences, traditional universities are facing a crisis: student demand for computer science degree programs has grown so swiftly that universities are struggling to keep up with enrollments. With the whirlwind growth in the technology sector has also come an increased demand for workers with specialized skills in coding in computer science, and, therefore, increased interest from students. A new entrant is emerging to address the potential gap in education and training: bootcamps. 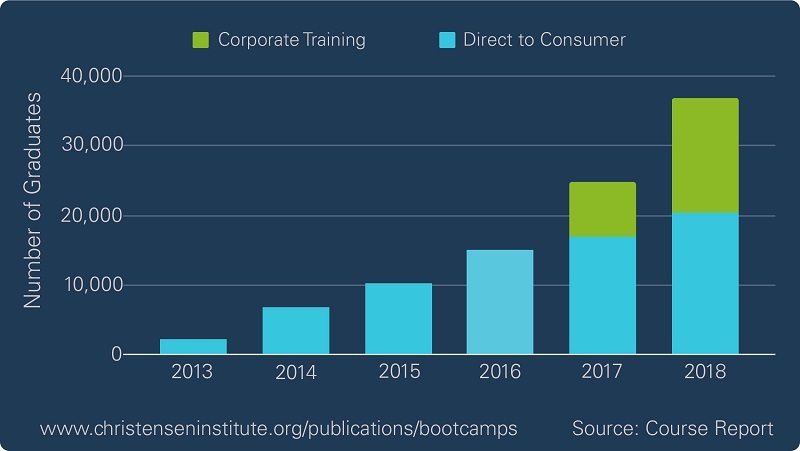 Bootcamps are short, intense, employer-aligned training programs that have particularly appealed to career-changers since they began cropping up in 2012, and are now graduating at least 36,000 students annually. Initially focused on web and software development, bootcamps have expanded into other digital careers like user experience and user interface (UX/UI) design. Bootcamps have rapidly become an important pipeline for tech talent, but are they disruptive? To answer this question, our latest research gathered data on 100 bootcamps, contextualizing and fleshing out this data by conducting over 25 interviews with bootcamp founders and leaders, hiring managers, college administrators, financing providers, bootcamp students, and other stakeholders. We then applied the Christensen Institute’s six-question framework to analyze the disruptive potential of a particular innovation to better understand whether bootcamps are disruptive, and what variables of the bootcamp model are most critical to predicting its future. 1. Is the innovation geared toward nonconsumers or those overserved by existing offerings? Yes. Bootcamps have two groups of consumers: the students they teach and the employers that hire those students. The students and employers that bootcamps target are ideal customers for a Disruptive Innovation because are overserved by traditional degrees or are simply not consuming them. Learners who want to gain the skills needed to get a job in the technology sector, but who can’t find a traditional higher education offering that meets their needs, are nonconsumers—and many bootcamp students meet this definition. Other students pursuing a tech-related traditional degree, and who find themselves spending more time and/or money than they would like for deeper knowledge than they need, are “overserved”. A bootcamp may be a better fit for their needs. Bootcamps target employers as customers in two ways. The first is by designing programs to produce graduates that have the exact skills employers need. The second approach is to market learning solutions to employers directly. 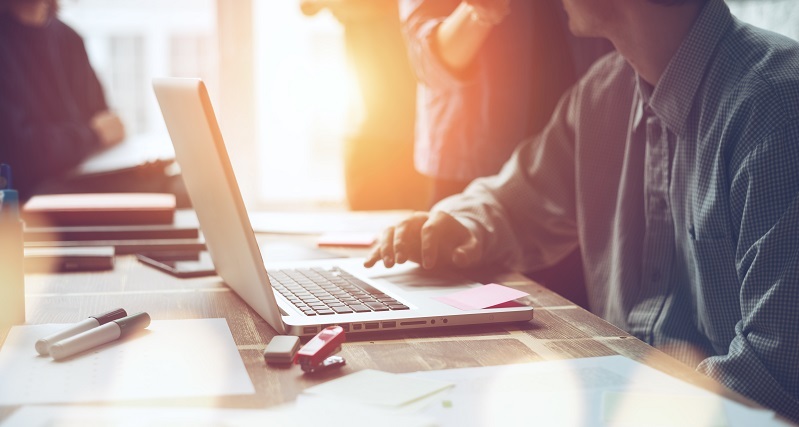 Employers can hire bootcamps to help reskill or upskill groups of existing employees with customized offerings, reducing new-hire costs and employee churn rates. Traditional higher education programs—especially degree-based ones—don’t typically target these needs. Yes. Bootcamps also lack many of the traditional bells and whistles of college, such as heavy physical infrastructure, athletics, performing arts ensembles, elite faculty, and social organizations. Further, bootcamps are unaccredited, meaning they cannot confer degrees, and their students cannot access federal financial aid funds. From a curricular perspective, bootcamps don’t provide general education courses, a grounding in the liberal arts, or even a deep dive into computer science theory. In short, bootcamps aren’t as good as traditional institutions in relation to traditional metrics—but they do seem to be preparing students to take on entry-level tech jobs. Mostly. In terms of simplicity, colleges struggle with a complex business model that requires them to balance general education and a grounding in the liberal arts with career-relevant training, all while conducting research and serving as a hub for community and regional economic development. In comparison, bootcamps are designed to help their graduates find good jobs. The bootcamp offering is shorter, clearer, and generally more streamlined than a traditional college degree. Bootcamps are typically far more affordable than the total cost of a traditional degree. But bootcamp programs do not qualify for federal financial aid, meaning that even though they are cheaper than a college degree, they may be harder for many students to afford. 4. Is there a sustainable, innovative business model? Yes. Bootcamps have fairly simple, clear value propositions for both students and employers: they promise to help students move into in-demand tech roles, and they promise to help employers build a pipeline of qualified talent. Considering resources, rather than high-end PhD’s, bootcamps employ instructors with a range of backgrounds, including college professors, high school teachers, and industry practitioners with a knack for teaching. Streamlining processes, most bootcamps consult regularly with employers, often through an advisory board, regarding the skills needed in the workforce. As those needs change, bootcamps quickly iterate their curriculum and course offerings, working backward to design learning experiences that help students master in-demand skills. As for profit formula, relative to traditional institutions, bootcamps have a lean cost structure. Bootcamp instructors typically earn no more than an assistant professor salary—far less than what a tenured professor earns. Bootcamps also spend less on infrastructure and real estate. 5. Are existing providers motivated to ignore the new innovation and not feel threatened by it at the outset? Mostly. The typical bootcamp student already has a bachelor’s degree, thus many colleges and universities have viewed the bootcamp demographic as not being part of their target market. Among the small fraction of institutions that are exploring the bootcamp model, the most common approach has been to outsource most of the work through a partnership with an external provider such as Trilogy Education Services or The Software Guild. An even smaller number of institutions have built their own bootcamps. For example, Northeastern University created its own data analytics bootcamp, Level, as part of a larger effort to “future proof” the university. 6. Does the offering have a technology that enables it to improve and move upmarket? Yes. The bootcamp space—but not every bootcamp provider—actually makes use of two different technological enablers, namely online learning and online work portfolios. Each is effective in its own right, but the combination of the two is especially potent. Running courses entirely online minimizes physical infrastructure costs, which allows some bootcamps to operate on a national scale without the costs and logistics of operating physical space. Further, online instructional models allow bootcamps to appeal to a wider variety of demographics and schedules, diversifying their consumer base. Online work portfolios consist of the major projects students create during a bootcamp program and provide a digital, transparent, competency-based signal detailing the skills a student acquired. Instead of graduating with letter grades and black-box diplomas, students graduate with evidence of the skills they have learned in a format that employers understand: concrete outputs.